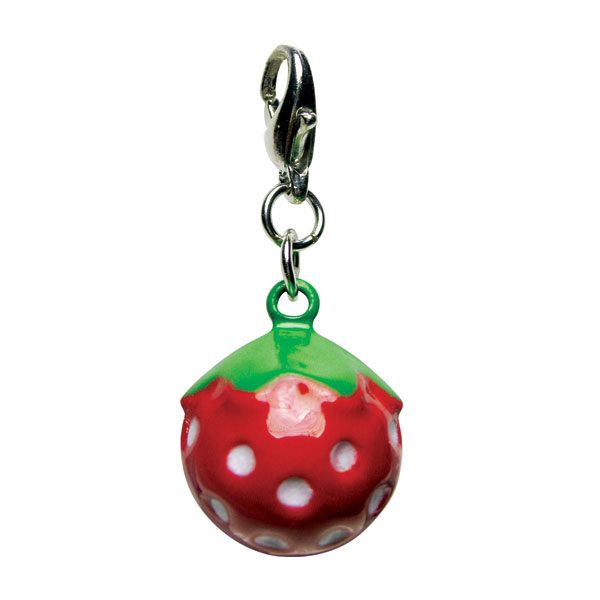 Sweeten your day with this adorable Strawberry Key-chain or Collar Charm! Use as key-chain or collar charm! 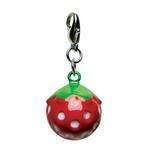 This yummy strawberry is a perfect addition to your pup's collar! The 3-D Strawberry Jingle Bell Dog Collar Charm is a cute 3-D poly strawberry figurine charm. It can be attached to the small D-ring of an outfit or to a dog collar! A split ring is included with the charm to fit onto a collar. One Size: 3/4" x 3/4" x 7/8"Height Does not include the clasp. Yummy Strawberry Metal Jingle Bell Dog Collar Charm by Klippo Customer Photos - Send us your photo! Posted On 11/23/14 by Megan G from St. Louis, MO Yes, Megan G recommends this product! This is my third time buying this bell for my shih tzu, Oolie. She's always had it on her collar and I've had five of them. We've lost two, I think, and have the third one on right now and the paint is coming off. I don't mind because they're not expensive and they're incredibly cute. They also keep up pretty well and one has gotten a little bent. They were very helpful in helping me with the first time promo code!